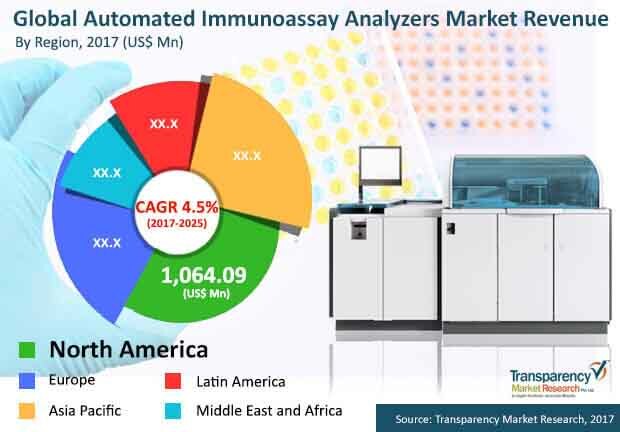 The global automated immunoassays analyzers market features the dominance of a handful of companies, namely bioMerieux Inc., Roche Diagnostics, and Abott Laboratories that enjoy leading market shares, says Transparency Market Research (TMR) in a new report. The dominance of these companies is attributed to their expansive geographical outreach and a diverse product portfolio that have helped them attain financial might. Product innovation and customization of existing products make up for key growth strategies for players in the market to emerge at the fore. Some other key players in the automated immunoassay analyzers market include Siemens Healthineers, Ortho Clinical Diagnostics, Bio-Rad Laboratories Inc., Randox Laboratories, and DiaSorin S.p.A. among others. TMR has valued the global automated immunoassay analyzers market at US$2.57 bn in 2016. Expanding at a CAGR of 4.5% between 2017 and 2025, the market is anticipated to be valued at US$3.78 bn by the end of 2025. In terms of technology, chemiluminescence immunoassay is likely to register an exponential growth rate and account for leading share in the overall market during the report’s forecast period. By sales model, the outright sale segment is predicted to register the leading CAGR during the 2017-2025 forecast timeframe, as savvy players are adopting this sales model to augment cash flow. Geography-wise, North America is likely to continue to remain dominant over the report’s forecast period as the region is home to some well-established players. The accelerated growth of the automated immunoassay analyzers market is driven by several factors. First and foremost, the increasing incidence of disease epidemics such as Zica and the increasing prevalence of chronic diseases such as hepatitis are chiefly fuelling the automated immunoassay analyzers market. Apart from this, trends of preventive healthcare and laboratory automation and integration are some other factors creating opportunities for the automated immunoassay analyzers market. Furthermore, the rising demand for result comparability and international standardization is likely to lead to the swift uptake of automated immunoassay analyzers. The swift uptake of advanced technologies is another key factor that will account for significant growth of the immunoassay analyzers market in the near future. While developed nations are likely to exhibit steady demand for automated immunoassay analyzers, emerging nations are likely to exhibit comparatively higher demand for automated immunoassay analyzers. This is attributed to rising disposable incomes along with favorable government initiatives and efforts for the betterment of healthcare facilities. On the other hand, cost constraints, especially among smaller diagnostic laboratories is limiting the adoption of automated immunoassay analyzers. Meanwhile, diagnostic laboratories in developed markets may face challenges due to declining reimbursements. Apart from this, stringent regulations and the need to operate under escalating price woes may adversely impact the market’s trajectory and also challenge business aspect of laboratories. Therefore, mostly laboratories are focusing on high volume testing that helps boost profitability per test. Diagnostic laboratories worldwide are increasingly adopted automated systems that helps to provide accurate diagnosis and carry out specialized test. Such factors are likely to significantly boost the global automated immunoassay analyzers market in the near future.